San Francisco Food Bank client Onesimo Flores joins California State Assemblywoman Fiona Ma and Food Bank Deputy Executive Director Leslie Bacho in front of the new hybrid truck. Food Bank client Ava is depicted on the truck, enjoying a "very, very, very, very, very special delivery." 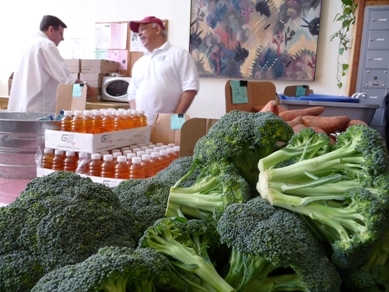 The San Francisco Food Bank recently celebrated the arrival of our first hybrid truck. Not only will the new truck mean a 38% savings in fuel costs, but it will also cut back on noise and pollution in neighborhood areas when deliveries are made. The new truck’s look is as bold as its fuel savings. Actual Food Bank clients are pictured on each side, holding groceries like those the truck will be delivering to our 200+ pantries. Our new truck, with some of the produce it will be delivering to hungry children, seniors and families. 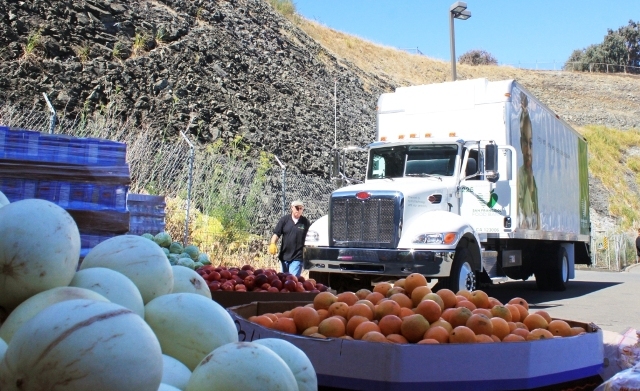 Over the next five years, the San Francisco Food Bank aims to replace all 11 diesel trucks in our fleet with hybrid vehicles, in order to meet state-mandated regulations. With our entire fleet converted to hybrid, we’ll see a fuel savings of approximately $25,842 every year. That’s enough to distribute an additional 103,000 pounds of food—or enough groceries for more than 80,700 meals! The media turned out in full force for the truck’s launch (including three different TV stations), and California State Assemblywoman Fiona Ma joined in the festivities, along with a very proud SF Food Bank client, Onesimo Flores, 74, who is pictured on the truck. 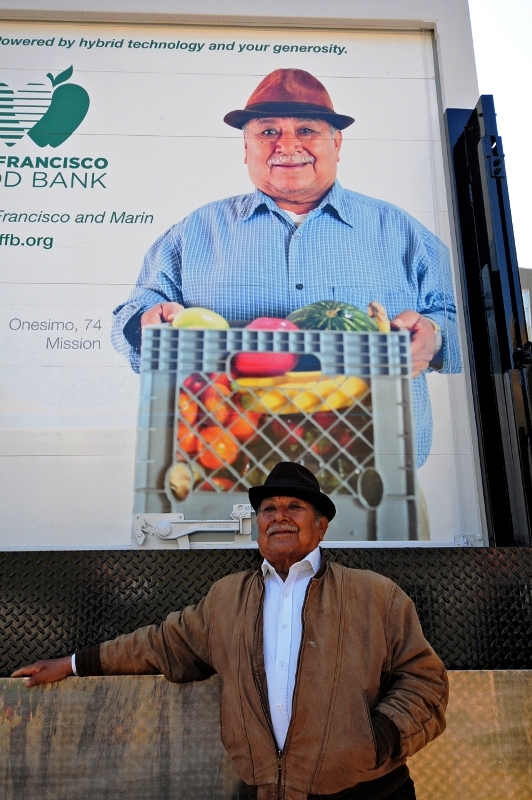 SF Food Bank client, Onesimo Flores, 74, poses next to his photo on the new truck. Our Grants Department worked tirelessly to make the new hybrid truck a reality. The truck purchase was made possible by a generous $100,000 lead gift from the Trustees’ Philanthropy Fund of the Fidelity Charitable Gift Fund and a $30,000 voucher from the California Air Resources Board’s Hybrid Voucher Incentive Project (HVIP). The San Francisco Food Bank is grateful to all of the community partners supporting the effort to green our fleet: CALSTART, Eaton, Pacific Gas and Electric Company, Coast Counties Peterbilt and Peterbilt Motors Company. Thanks also goes out to Susan Fleming photography and advertising agency Engine Company 1, for helping us with the truck’s new look and text. We need your help, too! Replacing all of our fleet with hybrid trucks in just five years is a huge challenge. If you’d like to help, please contact our Development Department at 415-292-1900. 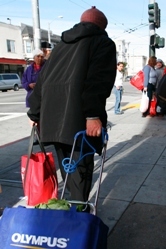 Edgar lives in an SRO in the Tenderloin, where he both volunteers at and receives food from the building’s Food Bank pantry. My name is Edgar. I’m 63. I was born and raised in San Francisco, and I used to work for a janitorial service off and on. I worked in kitchens. And a lot of other things, too, but I’d rather not say. I love cooking. My friend Lonnie and I, we’ve cooked dinner for the whole building a couple of times. This year, we cooked a soul food dinner for Black History Month. One lady donated some chicken. And then we took the dried beans that we got from the Food Bank, and we made some corn bread, and cooked up some mustard greens. I like to share meals with people because some people just don’t have it. You know what I’m saying? And long as I’ve got enough that I can eat myself, I don’t mind sharing. If you got a piece of bread and somebody else is hungry, you could take half of that bread and feed that person and it will take some of the hunger pains away. So I help bring the food in every Monday for the food pantry. I bring it in downstairs for everyone in the building. Most of the time, when it comes off the truck, it looks pretty good. And we make sure that everybody gets their share. People need the Food Bank so they can get from one day to another. It helps you get from one week to the next week. People need the help, you know. Myself, I’m on Social Security now. That’s $845 a month. It’s not much, but I make it work. I’ve learned to be frugal. Just because you have it, don’t mean you supposed to spend it. It has to last from one month to the next. I eat what I have and make my groceries last to the end each month. I don’t spend my money on frivolous things. I pay my rent, my phone bill, my life insurance. I buy groceries and things like that. And the rest of it I hold onto throughout the month. I don’t have no other expenses. Around about the fifth of the month, my daughter takes me grocery shopping at FoodsCo, and I buy basically the same thing every time: boneless chicken thighs, lunch meat and stuff like that. And I put it all in my freezer. That way, I can make it last to the next month, and I don’t have to eat the same thing every day. I can spread it around. Then, what I get from the pantry is the cereal, the eggs, the juices and things like that. Sometimes I’ll get the apples or the fruits and vegetables. I cook my own meals. Because if you live on a fixed income, you can’t go to restaurants. You can’t afford it. You have to learn to eat at home. I’ll fix me a pot of spaghetti and that’ll last me two or three days. Or I might cook up some spinach and throw in some eggs and eat it with a pork chop. And I don’t mind having a sandwich for dinner. Just as long as it tastes good together and I can make one thing taste as good as the next, I’m satisfied. It’s good. It’s all good.